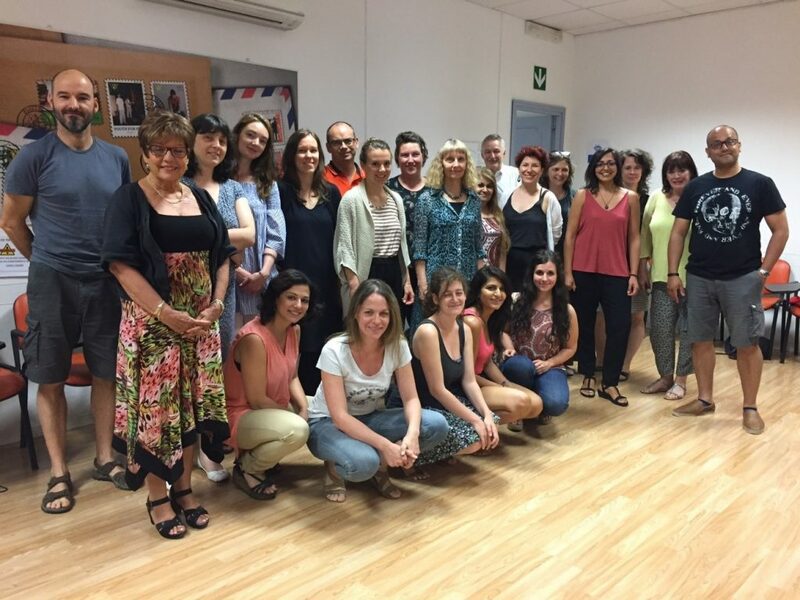 As part of the project activities three health professionals per each partner organisation have the chance to take part in a mobility experience in Italy (June 2017), Denmark (January 2018) or Hungary (July 2018) to learn new methodologies and exchange with colleagues from other countries good practices, success stories and challenges on diversity management and intercultural communication in the healthcare sector. The first blended mobility took place in Palermo (Italy) from the 19th to the 23rd of June, on the occasion of joint staff training to test the materials and the activities of the Healthy Diversity Course Curriculum for health professionals, which is one of the final products of the project. The training week was structured around five modules about the Healthy Diversity concepts and methodology, the development of practical skills for working in intercultural teams and diversity management skills when encountering patients as well as in healthcare institutions. In particular, through various non-formal activities twelve Healthy Diversity project officers and nine health professionals were offered the chance to increase their awareness about discrimination and unequal access to healthcare services for different patient groups, develop a greater understanding on the relevance of stereotypes, national legislation, social/organisational cultures and diversity lato sensu for medical practices, and enhance their intercultural skills by learning new methods and developing resources for teamwork and conflict resolution. In addition to that, during the Palermo training participants also had an insight in the two structures selected as good practices by the Italian partner, CESIE. The services are the ethno-psychological counselling offered by the clinic of Migration Medicine at the General Hospital “Paolo Giaccone” in Palermo and funded by the Migrantes Foundation (Caritas), and the Centro Astalli clinic, a volunteering association which is part of the local network of the Jesuit Refugee Service in Italy and provides free assistance to people with migration background through a wide range of services (e.g. breakfast, shower, a bazar for clothes, healthcare and legal assistance). Centro Astalli has developed the good practice of having “listening forms” containing all the personal information (experiences, ambitions and problems) that the users share with volunteer social workers during the first contact with the centre. Then, the profiles are regularly updated and always at disposal of doctors and lawyers during the counselling. Hence, in both the mentioned cases, such attention to the life experiences and the personal background of the patients, either through the combination of psychology and anthropology or with the continuous dialogue between doctors and social workers, perfectly reflects the essence of the Healthy Diversity project, as it promotes a more human and holistic approach to medicine for a greater understanding and better support to patients with different cultural backgrounds. Besides the nice and productive time we had in Palermo, the training represented a crucial moment in the Healthy Diversity project lifecycle, as the first blended mobility took place and the various sessions allowed the partnership to get feedback on the developed materials directly from health professionals in view of the creation of the Open Online Course “Healthy Diversity”, a resource aimed at sharing all the products of the project and promote the autonomous self-training of health professionals and other relevant groups.